LIKE MANY amphibian populations worldwide, boreal toad numbers have declined. Because of these declines, the Utah Division of Wildlife Resources, conducted extensive surveys between 1995 and 2003 to help determine our state’s current distribution of the toad. Paul with a boreal toad during a recent survey. 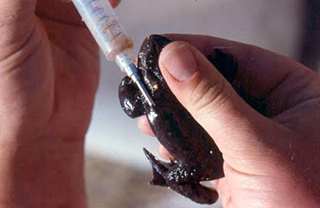 In 2011, a portion of the boreal toad’s range, which includes the state of Utah, was petitioned to be listed as a threatened or endangered species. The United States Fish and Wildlife Service is compiling information on the boreal toad and a decision on whether this species should be listed is expected in 2018. We’ve been working to improve boreal toads’ habitat, monitor their populations and determine their life history requirements for more than 20 years. 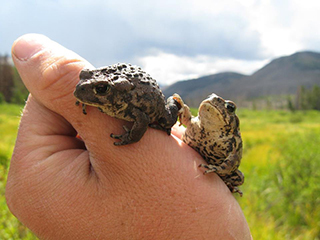 One pretty strong population of boreal toads occurs in northwestern Utah in the Grouse Creek Mountains. This population consists of around 10 breeding sites that have been studied for more than 15 years. A couple of boreal toads in the Grouse Creek area. Photo courtesy of Sam Mckay. While the initial goal of tagging boreal toads was to determine population size, the most interesting information, at least to me, that has come from this effort was learning that these toads are very mobile and travel long distances between breeding ponds. We’ve documented 17 boreal toads that have moved between a half-mile up to five miles across a sagebrush/juniper landscape in a desert environment! The most amazing boreal toad movement we’ve documented was from a toad that we moved as a juvenile to a location where we were beginning to introduce toads to start a new population. We moved this toad in 2006 when it was a little over an inch long; it was then re-sighted twice in its new location in 2007 where it had grown to over two inches long. While handling the toad in 2007, we noticed it had lost half of its right hind leg, probably to a predator. Then in 2009, we captured the toad back at the original location we had moved it from. At some point between 2007 and 2009, the toad had travelled five miles straight-line distance gaining 1,360 feet in elevation, all while missing half of one of its rear legs! PIT tags help us obtain population density information. We’re heading out to the Grouse Creek Mountains to PIT-tag more boreal toads so that we can again obtain population density information at breeding ponds. For this year, we have scheduled June 9-11th to tag boreal toads at three or four locations. We could use some help with this effort, so if you’re interested, please contact Sam McKay at samuelmckay@utah.gov. Boreal toads are more active at night, so we’ll be surveying breeding sites after dark using headlamps. Food and sleeping arrangements at one of our remote cabins in west Box Elder County will be provided! The work typically does not end until after midnight. I would love more info about this and I would love to participate if I can. What areas will you need help at? We live in Farmington. Found another toad up Curtis creek, monte cristo. Are you still wanting pics or info on where I seen this toad? 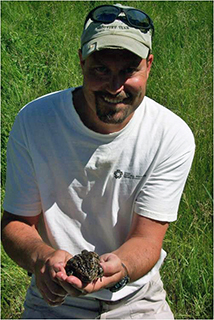 Brett – I will have our boreal toad biologist contact you on where you saw the toad. Thanks for reporting!